Swirl olive oil into a preheated medium sized pot over a high heat. Stir in sobrassada, capsicum, shallot, fennel, tomatoes, bay, garlic and smoked paprika. Season and cook until the vegetables have softened. Add the mussels and stir well to combine. Add the sherry and put on a tight fitting lid. Cook for three to four minutes, giving a shake every minute to ensure they cook evenly. The mussels should, save for a few recalcitrant ones, all open. The next consideration is the sauce. If it’s a pleasing consistency, serve immediately. 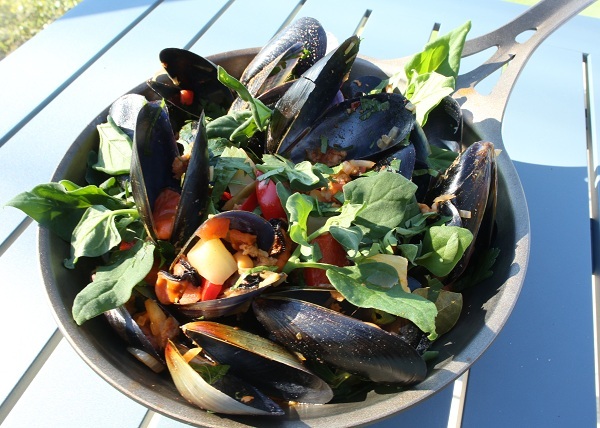 If not, remove the mussels with a slotted spoon and continue to boil hard until it reduces to a nice sauce then pour over the mussels and scatter with parsley.